Injury to the ACL is one of the most common sports related knee injuries. How does a tear present? Often associated with a "pop"
An x-ray is a 2 dimensional view of a bone. PLEASE BRING ALL STUDIES TO THE APPOINTMENT. 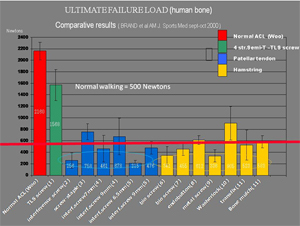 Although the gold standard for diagnosing an ACL injury is physical exam, the MRI confirms the injury with good accuracy and also evaluates for other associated injuries. P.T. is an extremely important component to ACL injury. Regaining full motion before surgery is critical for post-operative motion. The ACL does not have to be reconstructed in sedentary individuals, but higher level activity in a knee with no ACL puts the cartilage and other structures at risk for injury. Will PT heal/fix my Ligament? This is a question asked of us all the time, and the simple answer is no. However, surgery is not always necessary if return to higher level activity is not wanted, and there is no associated pain or symptomatic instability. Pre surgery physical therapy is very important for those who present with extreme weakness or stiffness. What is a ACL Reconstruction Surgery? Arthroscopy refers to a procedure done within a joint through small incisions, using an arthroscope (camera) to visualize the structures within. 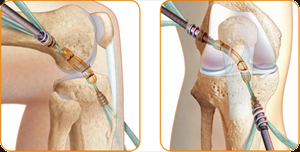 Arthroscopic procedures are commonly done on an outpatient basis. 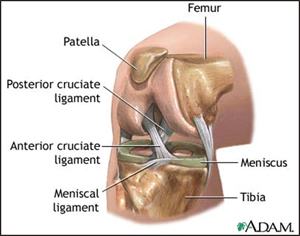 The ACL cannot be repaired; it must be reconstructed as a new ligament. This is done by using a tendon graft either from the patient's leg or from cadaver donor. The tendon is positioned in place of the injured ACL through tunnels which are drilled in the bone. The tendon is fixed in place with screws, or other fixation devices. Once the tendon has healed to the bone, these fixation devices become non-functional but do not usually need to be removed. Two to three small dime sized incisions are made to pass the camera and instruments into the knee. One additional larger incisions of about 3-4cm is used to harvest the hamstring tendon or patellar tendon graft. These are closed with sutures that will be removed in the office in 10-14 days after surgery.